Sherry A. Rogers, M.D. - The Cholesterol Hoax by Sherry A. Rogers, M.D. Home / Books / By Author / Sherry A. Rogers, M.D. 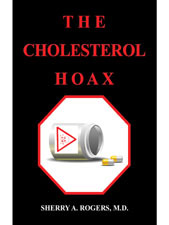 / The Cholesterol Hoax by Sherry A. Rogers, M.D. Enlarge Image Email to a Friend The Cholesterol Hoax by Sherry A. Rogers, M.D. About the Author: Sherry A. Rogers, M.D. is board certified by the American Board of Family Practice, board certified by the American Board of Environmental Medicine, a Fellow of the American College of Allergy, Asthma and Immunology and a Fellow of the American College of Nutrition. She has been in solo private practice in environmental medicine for over 38 years in Syracuse, NY where she sees patients from all over the world. She has lectured at Oxford and in 6 countries where she has taught well over 100 physician courses, has published over a dozen books including the landmark book Detoxify or Die (prestigepublishing.com), 20 scientific papers, textbook chapters, was environmental medicine editor for Internal Medicine World Report, received the American Academy of Environmental Medicine Rinkle Teaching Award for Teaching Excellence, has a referenced newsletter for 19 years, a non-patient consulting service, a lay and professional lecture service, is the guest on over 100 radio shows a year, and more.